PANHUIZEN - Church of Oirschot after a lightning stroke of 1904. PANHUIZEN, P. - Church of Oirschot after a lightning stroke of 1904. Church of Oirschot after a lightning stroke of 1904. - PANHUIZEN, P.
Title : Church of Oirschot after a lightning stroke of 1904..
Map maker : PANHUIZEN, P.. Size : 18.7 x 10.2 inches. / 47.5 x 26.0 cm. 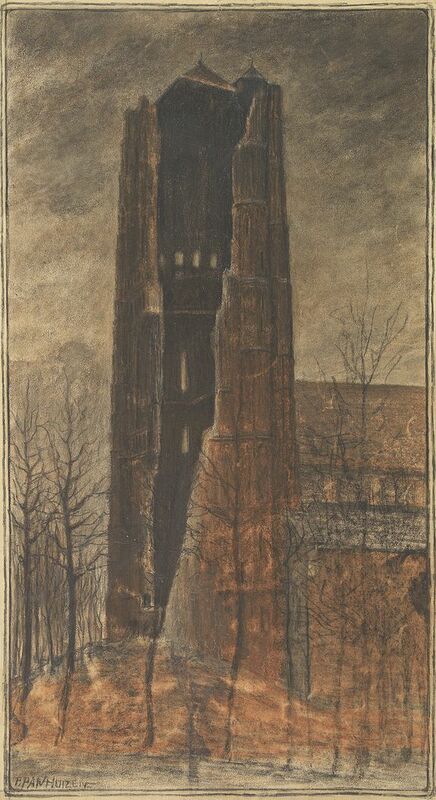 Description :Fine pastel drawing by Piet Panhuizen of the church of Oirschot after it was hit by a lightning stoke in 1904. Piet Panhuizen was born in Helmond and started as designer at the textile company Van Vlissingen in Helmond. It was A.Ouwerling who encouraged him to make drawings, paintings and engravings. Afterwards he founded an engraving work shop with several employees. Condition : Pastel drawing on paper.